Initially we visited Hobos Restaurant and Bar in Rehoboth Beach, DE as part of our “Far Out” travel column on the town, but after our second meal there –and being granted time to meet and chat with the chef/owner Gretchen Hanson, we had devote an entire blog to the experience. After all, not too many award-winning vegan executive chefs stop to talk to us. It was pretty exciting stuff. We also loved all the green touches to the decor as well. The design incorporated a lot re-used and upcycled elements, like the vintage bathtub garden and the lanterns created from old aluminum cans. Very eco-chic. Though we didn’t take any photos inside, the decor there bears mentioning. It’s a cafe with exotic touches: long flowing curtains, low sofas, and candle light. Very, very cool and nothing like other eateries you will find catering to the beach crowd in Rehoboth. This place feels way more west coast. Even the bathrooms sparkle with personality – with images of old-fashioned bathing beauties all over the walls! Though we dine out at least once a week, it’s not very often we get to meet the chef behind our meal. I’m talking chef, by the way, not the-gal-who-throws-together-a-sandwich-at-Subway. Being vegan herself for the past 11 years, Hanson gets what it means to be able to comfortably dine with your loved ones. She had worked in professional kitchens for 35 years and wanted to create a safe space for everyone to eat together, no matter their dietary preferences or needs. 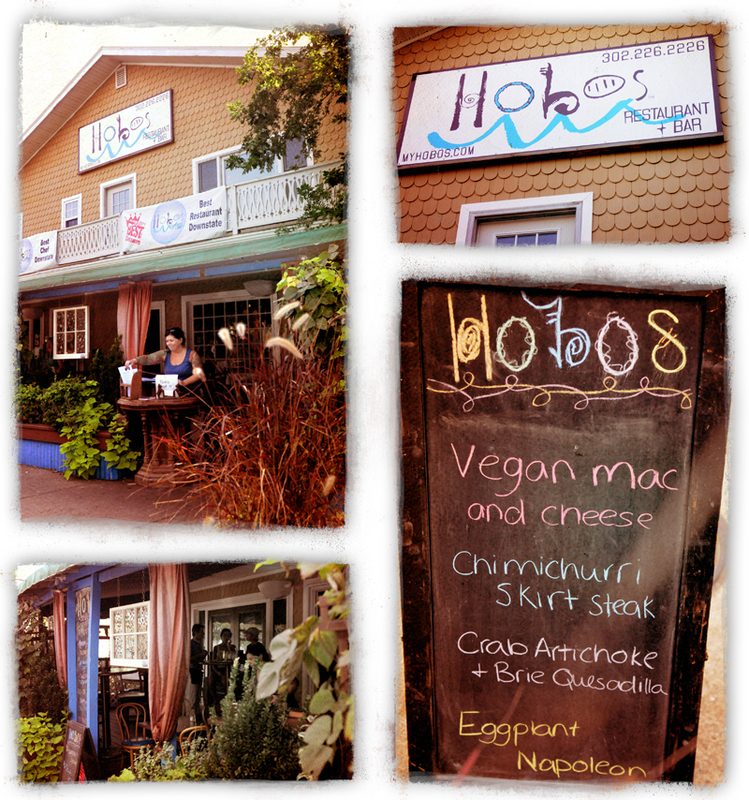 The menu at Hobos has not only vegan and vegetarian specialities, but also seafood, poultry, red meat and gluten free choices. You can truly bring anyone here to eat and every server we encountered was familiar with what vegan food was. And her cooking style reflects her fun, light-hearted attitude. Hobos‘ menu is based on street foods from around the world. Hanson calls it “eco-global fusion cuisine” and pulls from traditions in Mexican, French, Middle Eastern and Meditearrean cooking. How does vegan fit in? Quite nicely, actually. Hanson went vegan “to help save the world,” she said. But part of that mission is finding a way to redefine the mass-mind’s idea of what vegan is. We all know that when you say vegan food, most non-vegans think you’re talking about eating twigs and nuts and “weird vegetarian stuff.” Well, Hanson has an answer to this too: She teaches cooking classes and gives away her recipes. Yes, you read that correctly. An award-winning chef who gives away her secrets. They’re online, too, on her blog. Hanson is very serious about breaking the stereotypes of meatless meals. She wants to share her love of excellent vegan food with the world. And the world was ready when Hanson opened her doors. At her grand opening in 2009, 5000 people came and went through the doors at Hobos. By her fourth day open, every table was full. Maybe the world is ready for her vision. Or at least the folks in Rehoboth. Hobos was a recommendation of our friends Kim & Bob. They’re local to the area and know we are always on the prowl for good veg food. This is one of the best restaurant recommendations we’ve ever gotten, ever. Hobos was really wonderful. We ate there twice during our week-long stay in Rehoboth Beach. First we stopped in for dinner. Dh ate the Provence Quesadilla, which was a vegetarian offering with wild mushrooms, truffle cheese and truffle essence. It smelled heavenly. I ate the Hot Lil’ Vegan Quesadilla. It was stuffed with black beans, tomato, tomatillo salsa and Daiya cheddar. Both quesadillas were huge. We took our dessert to go: a vegan apple crisp with a pinch of curry spice. We warmed it up for breakfast and it was sweet and savory – really a dynamic and fun take on apple crisp. The crisp was a daily special. Our second meal at Hobos – a rather large lunch – started with a daily special, which was a vegan Carribean Black Lentil soup. It had a slow heat that hit you after a second or two, and the lentils were cooked perfectly – not mushy or overdone at all. Each flavor was distinct – the sweet potato, the spinach, the coconut. We also tried the Greek salad, which was honestly big enough to feed a whole family. You could taste the fresh herbs and the pitted black olives were super – not those bland canned ones from the grocery store. 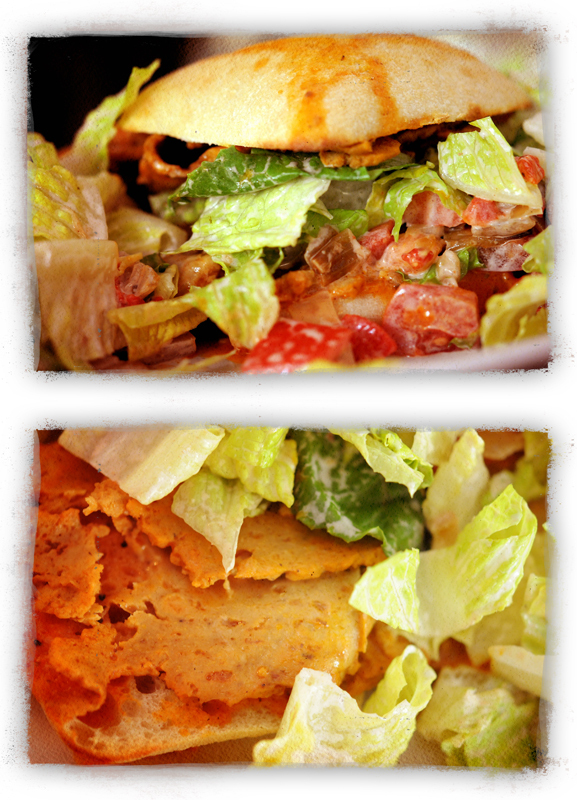 The buffalo seitan sandwich was as big as your head. Seriously. (We had so much food on the table, it was ridiculous.) The sandwich was served with another huge salad and had a fabulous blue cheese dressing. But it was vegan! I have no idea how Hanson got that very distinct blue cheese flavor into the dressing, but she did. The seitan was perfect, too. Thick, moist slices dripping with tangy, spicy buffalo hot sauce. We ate this sandwich weeks ago, but I still think about it sometimes. Also on our huge lunch table: Sweet Chili Tofu Buddha Bowl. These well-prepared little cubes were slightly crispy on the outside, and warm and soft inside. They arrived with a variety of dipping sauces and thinly sliced zucchini. The dish was simple and elegant. We also need to mention the cocktail menu from Hobos. Their original cocktails are fun and light-hearted, and many use organic liquors. 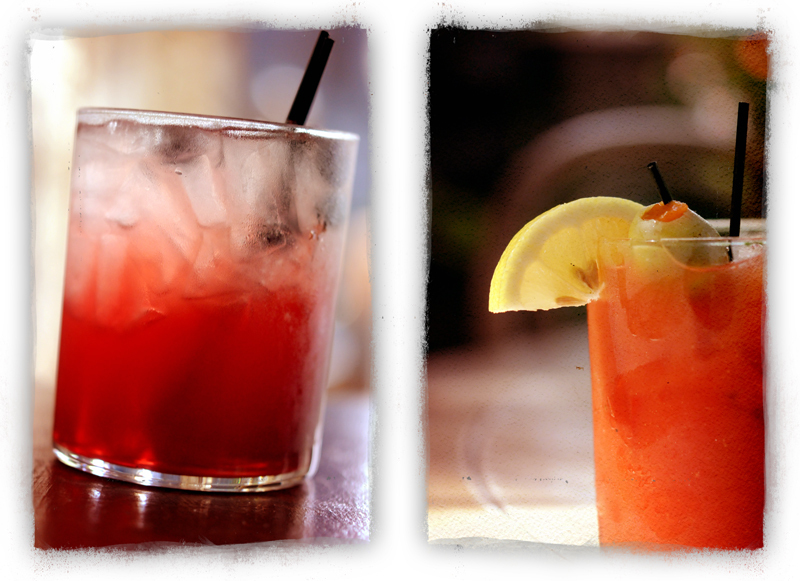 The drink on the left below is “Mommy’s Licious” and is a blend of blueberry vodka, organic pear juice and Fresca. On the right is the Hobos Bloody Mary, which blends Hobos’ homemade bloody mary mix, fresh grated horseradish, organic vodka, pepper and a secret blend of spices. Dh also tried the Cucumber Cosmo which was created with homemade cucumber-lemongrass-infused organic vodka, melon liquor and white cranberry juice, and another called Quite Simply the Best Mojito Ever that contained home-grown mint, fresh sugar cane, key lime juice and limon rum. Our marathon lunch was finished off with vegan Pina Colada cake. It was sweet, moist and had big chunks of pineapple. Divine. We can’t wait to get back to Hobos and try more of Hanson’s ingenious food. No wonder she got awarded “Best Area Restaurant” and “Best Chef” by Delaware Today. With 13 vegan offerings on the regular menu and 14 additional vegetarian items, Hobos is very veg-friendly in addition to sourcing local and seasonal foods. And there are always more specials than what you’ll find on the usual menu. We’re with you, Chef Hanson. And we think your artistry in the kitchen deserves more awards and accolades. See ya again as soon as we can get back to the beach! To visit Hobos, check their website for hours. They are located at 56 Baltimore Ave., Rehoboth Beach, DE. Call them at 302-226-2226. Made in Maryland. Who knew those words could be so sweet – and salty? Guess the folks at Salazon Chocolate Company knew it. See, they’re not only local – with their production in Eldersburg, MD – they are also the first dark chocolate company to base their bars on salt. Founded in 2009, they’re pretty new on the market – but Salazon Chocolate is a force to acknowledge in the world of candy bars. Their bars are all made from 100% organic, Rainforest Alliance–certified beans in small batches in the USA, and hand-sprinkled with natural, solar-evaporated sea salt. And prepare yourself for when you actually peel the wrapper off the bar. It’s not scored into little squares. The molded chocolate bars depict a scene from the exotic land where their ingredients are sourced. It’s stunning, and not at all what you expect. Salazon, which is Spanish for “salted,” currently offers four sweet-salty, delicious flavors. The bar with the white wrapper is their signature organic dark chocolate with sea salt. The blue wrapper is organic dark chocolate with sea salt with cracked black pepper. Our favorites… the yellow wrapper, boasting organic dark chocolate with sea salt with turbinado sugar and the green wrapper: organic dark chocolate with sea salt and crushed organic coffee. To make this local company an even bigger winner: all the bars are vegan, gluten-free and kosher. Oh – and did we mention, they’re practically addictive? You can buy Salazon Chocolate online at the Vegan Store. Or visit their website to find a store near you that carries this inventive and tasty treat. We’ve gotten ours at both Roots and Whole Foods recently. And we’re planning to get more asap. Earlier this month, we attended an arts & craft festival in Harrisburg, PA. There were loads of goodies there, lots of fun things made by local crafters. But nothing was quite as memorable as a stand called “Mostly for the Birds.” The artisan was a sweet lady named Linda from central Pennsylvania. Linda finds unwanted scraps and pieces of wood, and builds quirky, cool birdhouses, feeders and other fun objects. She told us that all the fixtures are new – like the hinges and screws – but overall, she uses lots of upcycled construction materials. And she can tell you exactly what kinds of bird will like each of the houses and feeders. 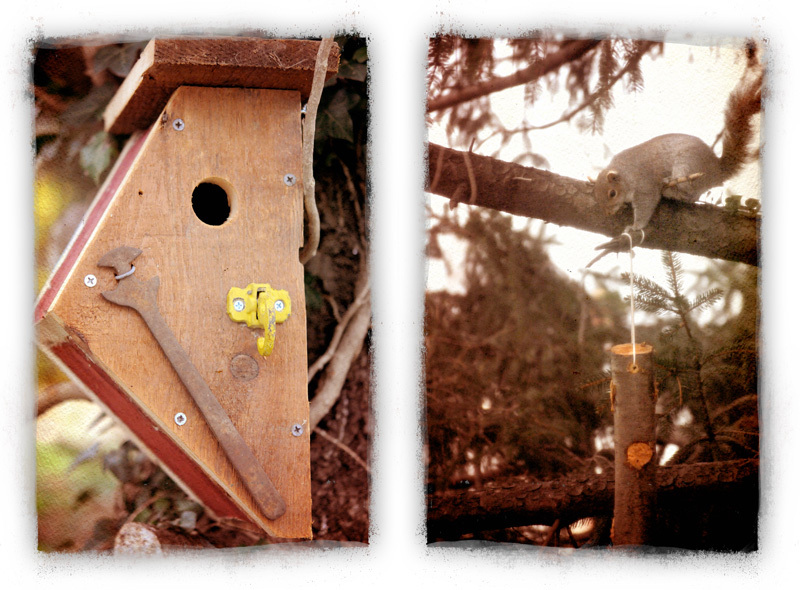 We got this trapezoid birdhouse and log-feeder at the arts & crafts show. Unfortunately, Linda isn’t selling online yet. If you’re local to the area, you can drop her an email (llitz@pa.net) and she’ll be glad to send a schedule of her upcoming shows/list of places you can get her playful, fab creations. Things are going well with ours. Though as you can see, the squirrels usually beat the birds to our log-feeder. Squirrels love peanut butter, that’s for sure! Thanks Linda for making your upcycled and funky bird feeders and houses. Our backyard wildlife will go through the winter a little warmer , with fuller tummies this season thanks to you! Right about now you want a meal that’s simple to make. Something that requires little effort but delivers maximum awesomeness. After all, you want to hit all those after-Christmas sales. 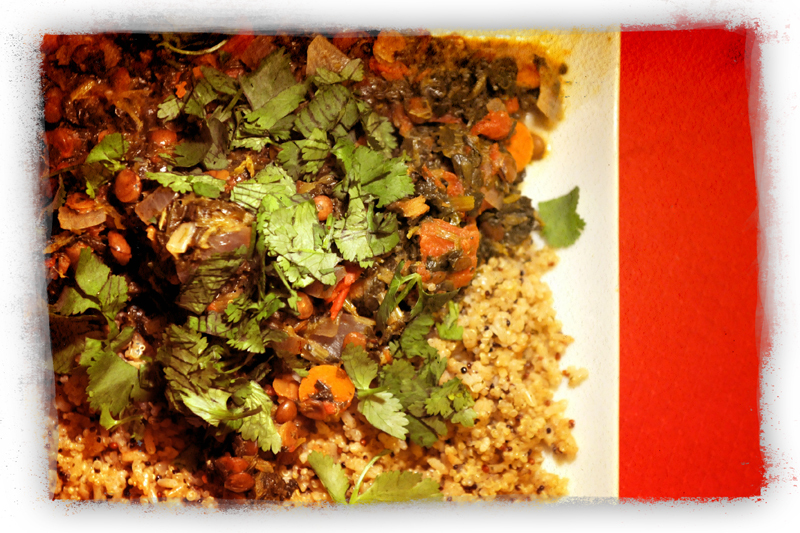 We suggest you try this wonderful Quick Spinach and Lentil Curry from the Girlie Girl Army’s blog. These ladies are eco and vegan, and you may even get a little post-holiday inspiration from their site. We ate ours with a quinoa/brown rice pilaf and it was perfection. The recipe makes four hearty portions and you can make it milder or hotter, as you like. You can also use veggies you have on hand – it’s a flexible recipe. Which is what we all need the day after Christmas. Spice up your Monday with this savory and filling Quick Curry. And like we always say, we can’t print the recipe here – but we’re glad to link it for you. Merry Christmas Eve to you ~ hope you are all ready to kick back, relax and enjoy time with someone you love. 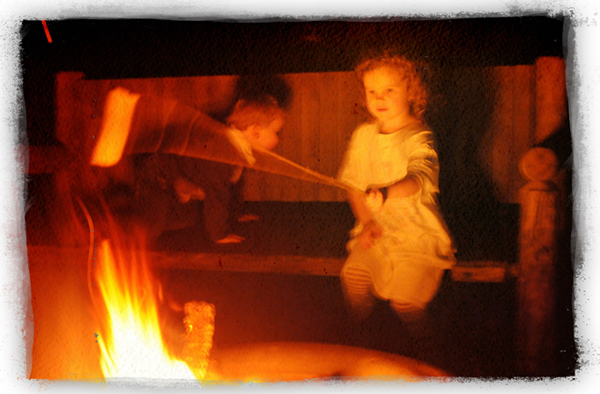 On holidays, we love traditions – new, old and re-invented. 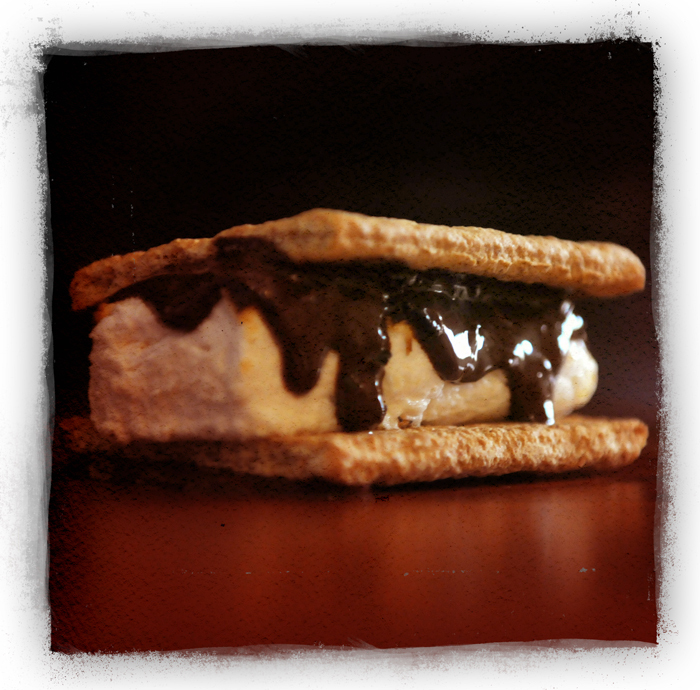 We propose that as you sit by the fireplace tonight, you make some s’mores. Right, right, we know. Marshmallows have gelatin. But not all of them to. 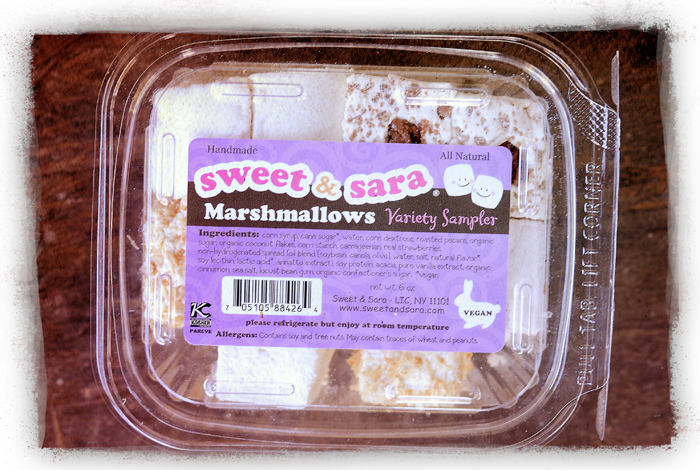 Like these little fluffy pieces of delight from Sweet & Sara. They’re handmade, vegan, kosher and all natural. Perfect for those little elves to roast by the fireplace. It’s true that Santa is expecting cookies tonight. And there’s nothing wrong with that. But why not surprise Old St. Nick with a vegan s’more instead? Perhaps he will reward you with some extra holiday cheer in your stocking. Maybe he’ll even leave you more marshmallows or other goodies from Sweet and Sara. Oh – and in case Santa forgets your marshmallows, you can get them online from the website or at select Whole Foods and other stores. People find beauty everywhere. For local Baltimore artist Debbie, she can look at swatches of cloth and see bouquets of elegant flowers blooming from the fabric. 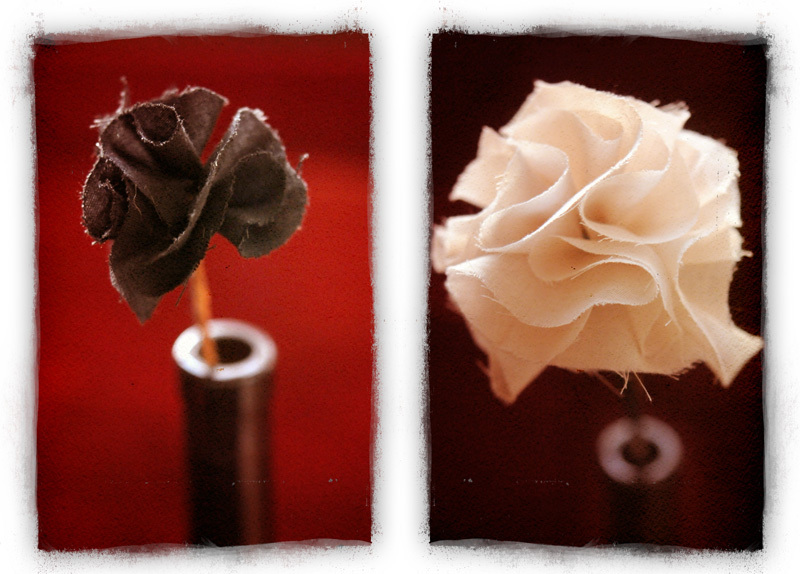 She handcrafts her blossoms from vintage and upcycled materials and they’re available on her website, Tattered Petals. As a girl, Debbie learned to sew from her mother. Now a grown woman, she has suitcases and trunks full of fabric remnants ~ she never threw away anything from all those years ago. She felt each small swatch was too lovely to let go. We’re so glad she kept them. Just look what they have become! To find her inspiration, Debbie looks to the changing shapes, patterns and colors or nature as she creates single stems, bouquets, brooches and hair fascinators. All of her work is one of a kind, and each piece has a unique history- be it an old prom or bridesmaid dress, a vintage flapper gown or another treasure – reincarnated into a new object of beauty by Debbie. Her Tattered Petals are a wonderful home accent or eco-fashion accessory. 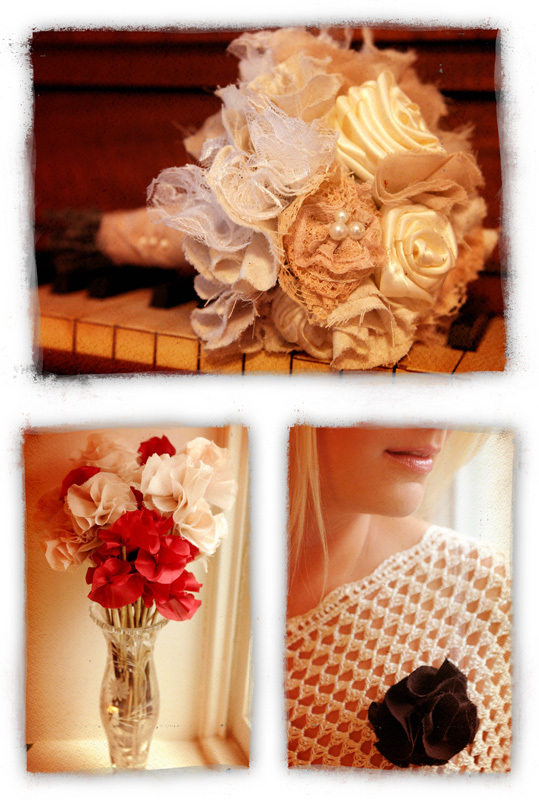 She also makes wedding and special-occasion bouquets. 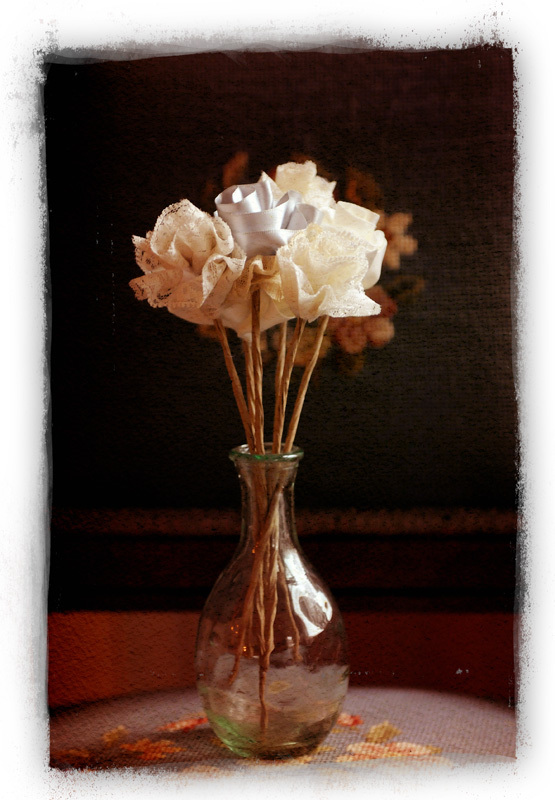 Oh – and the prices are very reasonable for a handcrafted flower! She starts in the $8 to $10 range for single stems and brooches. It’s a great deal. Find a moment of peace in the upcoming holiday shuffle to walk through Debbie’s online field of flowers. They are each special and have a story to share with you. Take time for breakfast today. Put down that Lara Bar – you’re making tofu scramble. It’s a hearty, hot, healthful breakfast and promises a better-than-usual start to your day. And hey – who are we to judge if you decide this makes a good lunch or dinner. Tofu scramble is always good. Saute onions and garlic in olive oil for about 3 minutes, until beginning to brown. Add tofu crumbles, tomato, turmeric, cumin, salt & pepper, and a splash of water. The amount of water you need will vary based on how wet your tofu and tomatoes are. We tend to drain ours very well, so we usually need about 1/4 cup of water. If your tofu is moister or your tomatoes are juicy, you’ll need less. The water is just to keep the mixture slightly wet in the pan. It should not be liquid-y. Cook over medium heat until everything begins to brown slightly and the veggies are cooked through. Stir in Daiya just before finishing, if using. It will melt fairly quickly. 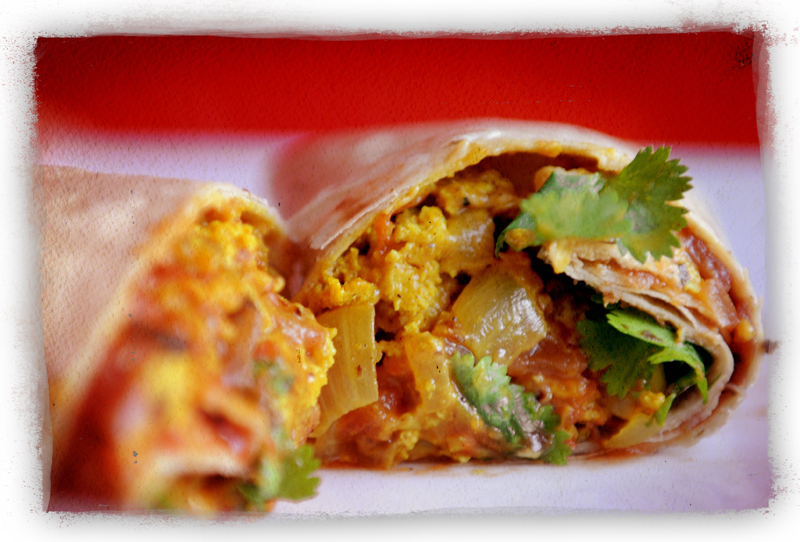 Portion the tofu scramble between 4 tortillas and top with chopped cilantro, salsa and hot sauce. Enjoy – and have a happy morning! This book had a workout the past few weeks. I’m surprised the binding hasn’t given way. 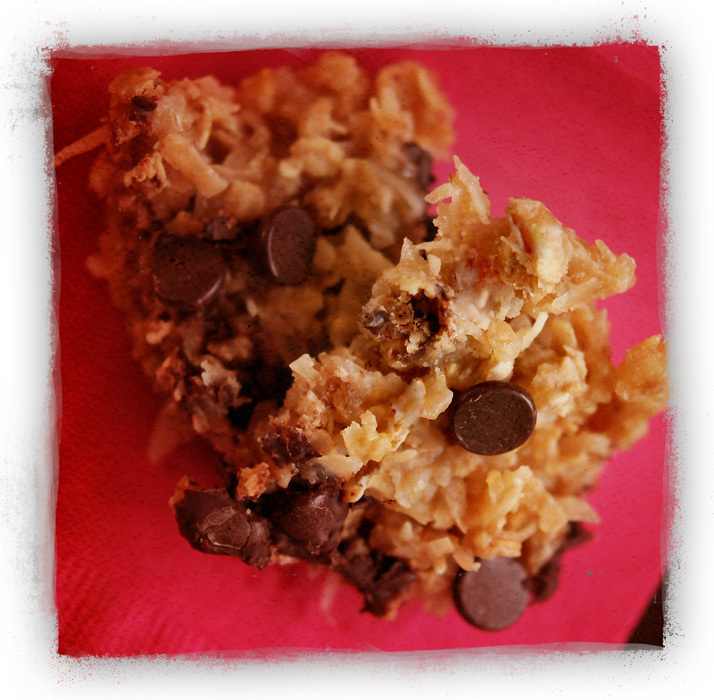 No kidding – I’ve made 14 different recipes from Kelly Peloza’s Vegan Cookie Connoisseur cookbook. You’d think I was opening a bake shop, right? Honestly, I love baking and cookies are among my favorites. They’re cute, sweet, small. They can be soft or crunchy – simple or fancy. You can eat them any time of day or night. They pair with hot drinks, like tea, coffee or cocoa. Or just as well with cold soy milk. What’s not to love about cookies? Clearly, cookbook author Kelly Peloza feels the same way. In addition to her book, which was published in 2010 and is available at Amazon and Barnes & Noble, she also maintains a blog by the same name, Vegan Cookie Connoisseur. You know I would have said, at first glance on her bio, that Kelly was too young to be a connoisseur. She is a spritely young woman, fresh out of college. The word brings to mind sophisticated, graying people in fancy suits swishing expensive wine around in glasses to me. But after using her book – I would agree. She really is an expert and has clearly mastered the vegan cookie category. Cutsey Fruitsy Raspberry Almond Sandwich Cookies (the tree and star shapes at 6 o’clock), page 253 – This was hands-down the most advanced cookie we selected from the book. She doesn’t rank any recipes by difficulty, however, this one took me two hours to make and I am a very experienced baker (I even used to work in a Greek bakery and can make both cheesecakes and baklava easily – with no recipes). The effort is worth it though. Have faith – the dough will roll out and patches up fine during the baking process. Don’t use any over-complex cutters – she recommends flower shapes. It’s a good call – those are easy to cut. The stars and trees worked well too. Keep at it with these – they’re five-star when you’re done. Peanut Butter Molasses Cookies (with nuts on top, near 10 o’clock), from page 54 – This cookie is a true original. Everyone loves it. It takes the experience of a peanut butter cookie to a totally new place and it’s a very, very good place. The recipe is easy and straightforward. A novice baker could make this and impress anyone – vegan or not. Peanut Butter Oatmeal Cookies (almost not visible, at the very top, near noon), on page 57 – A solid, sturdy, wholesome cookie. We loved the addition of oatmeal to this old-fashioned favorite. Our families especially liked this -it’s a nostalgic classic. Also simple to make. Espresso Chocolate Chip Shortbread (right at 1 o’clock – it’s the corner peeking out), page 245 – If you love coffee the way DH does, this is the cookie for you. I don’t even drink coffee and I liked it. The mocha-esque blend of chocolate and coffee is a winner. It’s snappy, crisp and holds up for dunking, too. 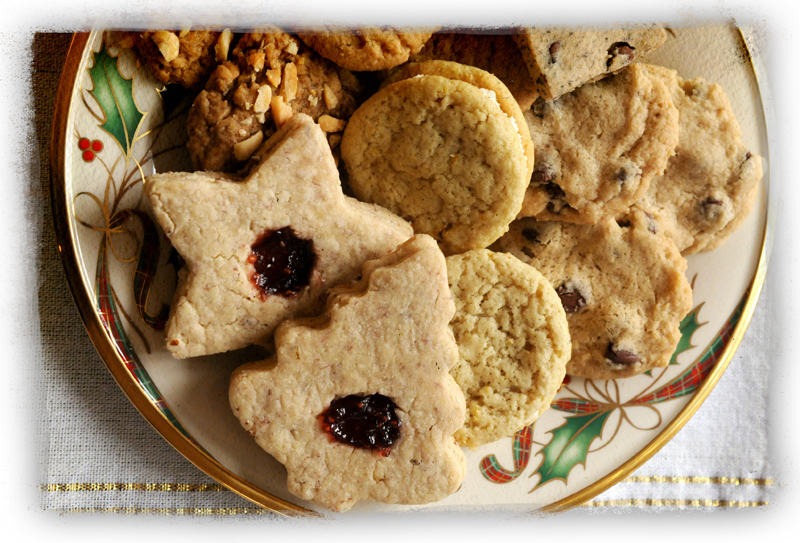 The perfect cookie to accompany your morning brew of coffee or cocoa. Soft Baked Chocolate Chip Cookies (at 3 o’clock on the plate), page 213 in the book. Another classic. Sweet, moist, lovely. And no one will ever, ever be able to guess this is vegan. Go ahead, fool your friends. You know you want to. Pink Lemonade Cookies (small round yellow sandwich cookie, at 5 o’clock), page 21 in the book. 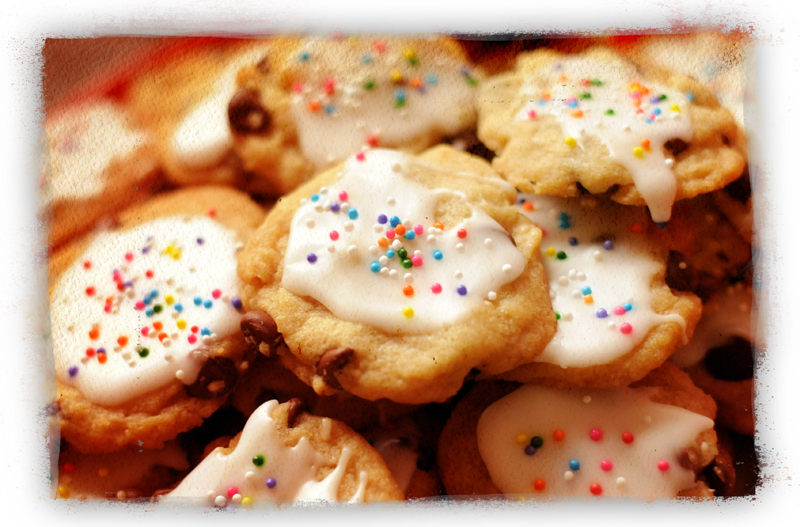 Okay… drum roll for this cookie, please…. this is the BEST D%&N COOKIE EVER. We have made batch after batch. We gave it out in gift tins and almost everyone wanted the recipe. Talk about no one believing a cookie was vegan. This is sheer brilliance in a cookie. If you need one good reason to get this book, the Lemonade Cookie is IT. I cannot express the sublime blend of citrus and sweet, and the paired soft and crisp textures. Sigh… I may need to go eat one now. My only comment – Peloza calls for food coloring in the icing. We skipped it and the pretty yellow color works fine. 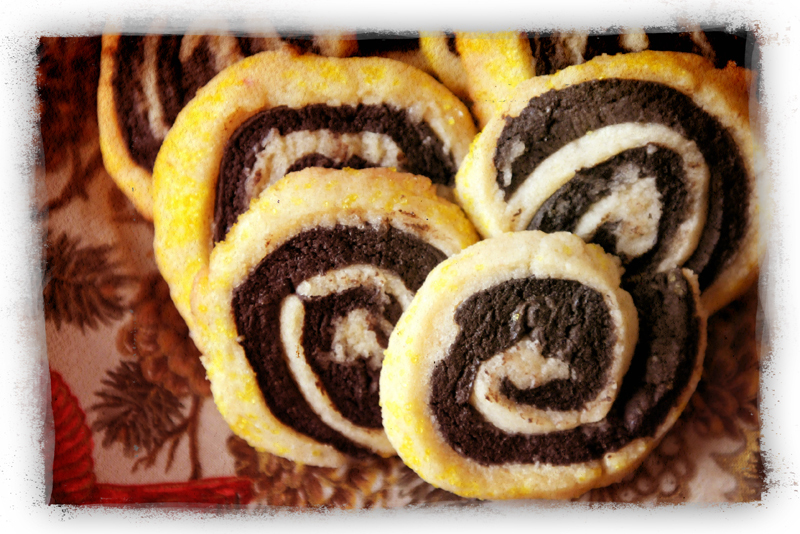 Crispy Pinwheels with Pink Sugar, page 234-235. Of course, I didn’t have pink sugar, so I used yellow sugar. They still taste delish and no one who hasn’t seen the recipe is any-the-wiser. The recipe states this one is challenging, but I didn’t think it was that hard. If you follow the directions exactly, it works like a charm. The vanilla and chocolate combo is really good – and the overall appearance of this cookie very uptown. Everyone will be impressed. These are Sticky Coconut Chocolate Chip Oat Bars, page 158. Not sure where I went wrong with this cookie, but it didn’t set up until I gave it a trip to the fridge overnight. I feel like this is the perfect filling for a chocolate-coated candy. Two people even said they tasted like a Mounds bar. I may try making this one as a candy filling. However, I want to add that the flavor is rock solid. I haven’t eaten a Mounds bar in something like 20 years, so I’m not sure I remember them. 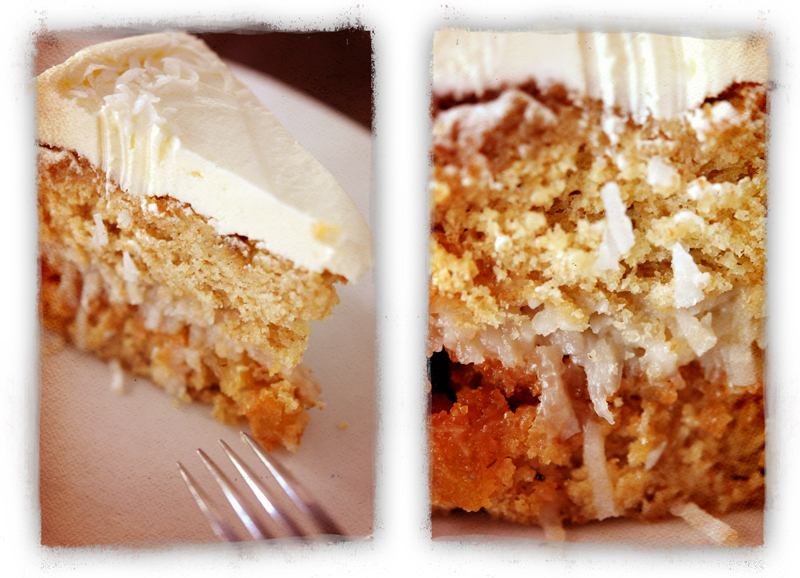 But this is gooey and coconut-y and gets a thumbs-up on taste for sure! These beauty are Garrick’s Chocolate Chip Cookies, from page 215. I added my own touch though, with the icing and sprinkles. The cookies are one of Peloza’s many variations on the classic chocolate chip in the book. It works well and makes a very fine cookie. The icing is simply 1 cup of powdered sugar with 1 Tbl. water. You mix it together and drizzle it over cooled cookies. The vegan sprinkles can be found at most candy supplies – they do have fake-y food coloring though. You can buy natural sprinkles online at the Natural Candy Store if you are into fake-y food coloring. We also made, but didn’t shoot, the Glazed Apple Cider Cookies on page 14; the Eggnog Cookies on page 18; Giant Bakery-Style Double Chocolate Cookies on page 78; Lemon’s Dark Chocolate Truffle Cookies, page 80; Coconut Cookies, page 134.Of these our favorites were the Glazed Apple Cider Cookies and Coconut Cookies. Both are terrific and the Apple Cider Cookies are another heavenly original creation by Peloza. You should absolutely check out Vegan Cookie Connoisseur. The book has 140 cookie recipes and while the 14 I made only represent 10% of the total recipes – I’d say this book is worth adding to your collection. Oh – and be sure to look for Peloza’s blog, too – she adds new recipes and fun stories all the time. Giving new life to old stuff is always a groovy thing. Like old magazines and catalogs. And who doesn’t have plenty of those this time of year? Sure, you can toss them into the recycling – or upcycle them into festive holiday trees. We’re glad to show you how and this project is very simple. Even a younger child could make one. Find an un-needed catalog or magazine. You can use any size. Step one: Fold the first page from the upper right corner to the binding in the in the middle. Run your hand back over the crease. Step two: Take the folded edge of the page and fold it in half again until it meets the binding in the middle. Crease it. Step three: On the bottom is a little triangle. 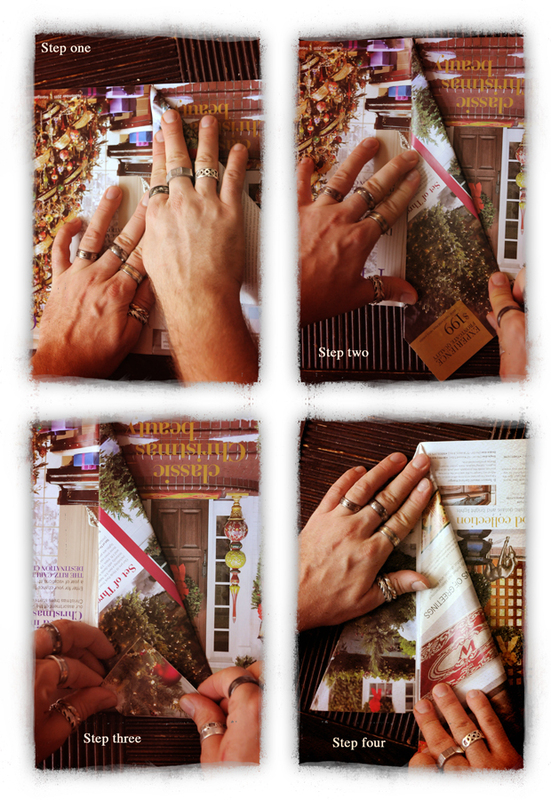 Fold this upwards to be flush with the bottom of the magazine/catalog. And crease it. Step Four: Repeat with every other page including the covers. 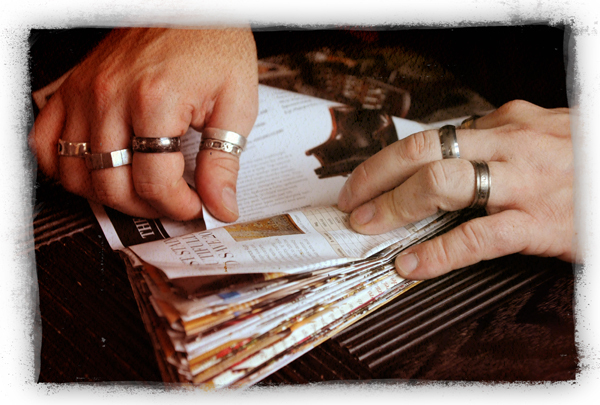 Just keep at it, the thicker the magazine or catalog, the more you’ll have to fold. Towards the end, the folded side gets rather thick. It helps to sort of keep the folded pages on one side and the flat pages on another while you work. Once you’re all done, you can decorate with your magazine trees as-is or add paint, glitter, ribbons and other ornamentation. Use stuff you have on hand, if you can. 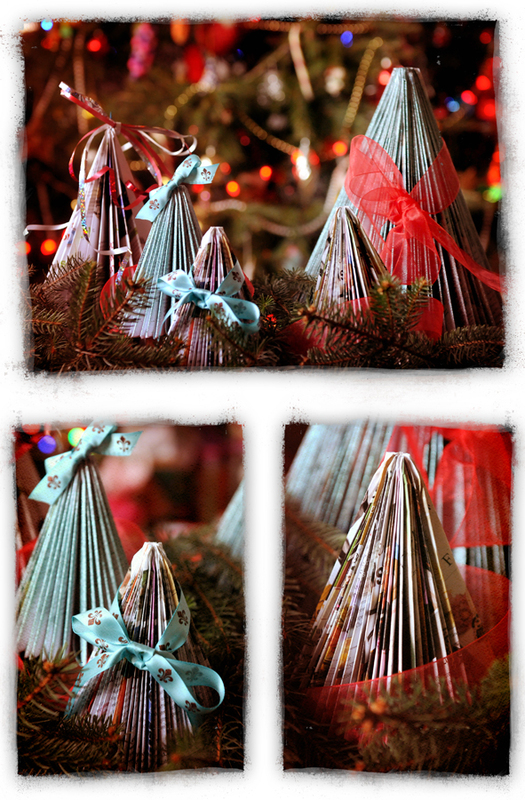 We used blue glitter paint on two; some leftover ribbons scraps and put the “toppers” on the two trees with bows using toothpicks. You’ll be pleasantly surprised how very cool it looks when it all comes together! Still shopping for that dog-person on your list? Well, you’re in luck. We’ve got awesome ideas for you today. They’re green, good and (mostly) practical. And none of them are those crappy, non-recycleable plastic toys that dogs chew up in 5 minutes and makes a mess all over the living room. Skip that this year. Go green instead. The top of the list is the “Pillow Pocket Bed” from Midwest Greyhound Adoption. This incredibly cool dog bed (it’s not just for greyhounds -though, yes, we happen to have one) fits four standard size bed pillows. Your old pillows get a new life in a bed for your pooch. It’s a win-win: you can recycle your pillows and your dog gets a comfy bed that smells like you. What dog wouldn’t love that? We tossed our old pillows in the dryer for a few minutes to fluff them up and them put them in the bed. Our hound loves it. The beds benefit greyhound rescue, was made by volunteers and helps raise funds to get homes for retired racers. Each bed costs $28 plus shipping and you can find them on their website under the “greycare” link. Thinking more of a stocking stuffer type item? How about a dog food bowl made from sustainable bamboo? This option is widely available both in stores and online. You can pick one up at Petco or order from Harry Barker. Expect to spend about $5 to $12 on these bowls. Need something even smaller? How about biodegradable pet waste bags? Every dog owner can use these! This is more in the $4 to $6 range and you can find them at Petco, on Amazon and at local stores, like Bark in Clarksville. Okay, so we had to throw in something fun and silly. How about a tee shirt for the dog – made of bamboo fabric? This “Green Dog” tee was made by Casual Canine and is 70% bamboo and 30% organic cotton. There are lots of varieties online, though – just Google search “bamboo dog tee shirt.” Yes, you’ll feel a little silly. But isn’t she adorable in that eco-dog tee? 🙂 This item cost $15. See, you still have options for the pet lover in your life. And remember – keep an eye on your hounds & kitties around the Christmas tree this year. A safe holiday is a happy holiday for your four legged friends!